The sea floor may look barren, but Qi Fu, an experimental geochemist at the University of Houston, says there are places where it is teeming with life. 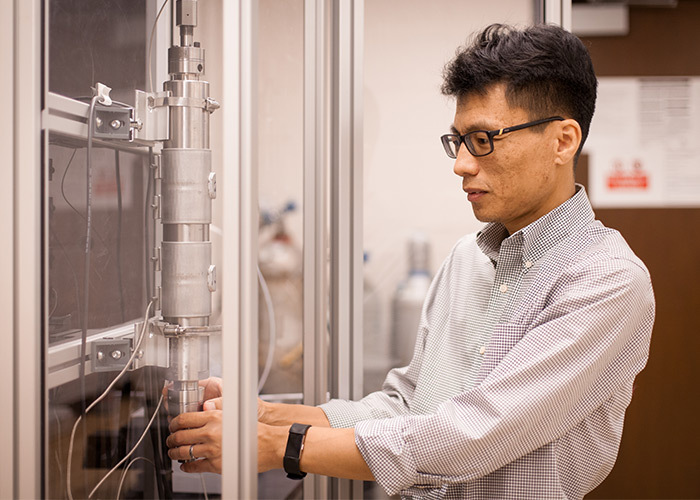 Experimental geochemist Qi Fu adjusts an experimental reactor being built to better understand the abiotic formation of organic molecules in seafloor hydrothermal systems.Hydrothermal vents, fissures on the sea bottom which release fluids heated by volcanic rocks, are particularly rich, but science can’t yet explain how the organic compounds found there are formed. Fu, assistant professor in the Department of Earth and Atmospheric Sciences in the UH College of Natural Sciences and Mathematics, has received a five-year, $516,575 CAREER Award from the National Science Foundation to pursue the study of how organic compounds are formed in hydrothermal environments on the sea floor. Carbon-bearing fluids and gases – methane and other organic compounds – are often found issuing from hydrothermal vents, and scientists know they are important components of microbial communities. Understanding how the compounds are formed is crucial to learning more about life in its most basic forms, Fu said. “The origin of life may have been on the sea floor,” he said. But there’s a gap between what researchers can observe in natural systems and what they have been able to replicate in a laboratory. Fu’s work seeks to bridge the gap. The research involves simulating the conditions of hydrothermal vents on the sea floor – temperature, pressure, chemical composition and other variables – and attempting to generate organic compounds from inorganic components. His collaborators are marine geochemist William Seyfried Jr. of the University of Minnesota and Shuhei Ono, an isotope geochemist at the Massachusetts Institute of Technology. NSF CAREER awards are granted to promising junior faculty members who exemplify the role of teacher-scholars, and recipients also do educational outreach to promote a better understanding of science and technology. Fu will work with students at Yates High School and those at other Houston Independent School District schools, offering mini lectures at the schools and bringing students to the UH campus to tour Earth and Atmospheric Sciences labs and learn more about the University. He said he also will work with the Houston Museum of Natural Science for their World Oceans Day program.